I've always been in love with Indonesian food. Maybe it's because that's what I grew up with, but mostly because it is the best kind of food in the world. For me. As much as I love cute, sweet macarons, they never excel the humble klepon (rice balls filled with melted palm sugar). And no beef dishes has ever enticed me more than a bowl of rendang (Indonesian slow-braised beef with various spices) can. Of course, it all comes down to our own tongue and preference, right? But let me just spread the love, and show you how Indonesian food has made me so proud being an Indonesian. These dishes that I will post on the label of 'Indonesian Culinary Gems' will also include the ones I am not familiar with, or even those I haven't tasted. This way, I can learn more as well! Alright, first up, let me introduce you to: rawon. 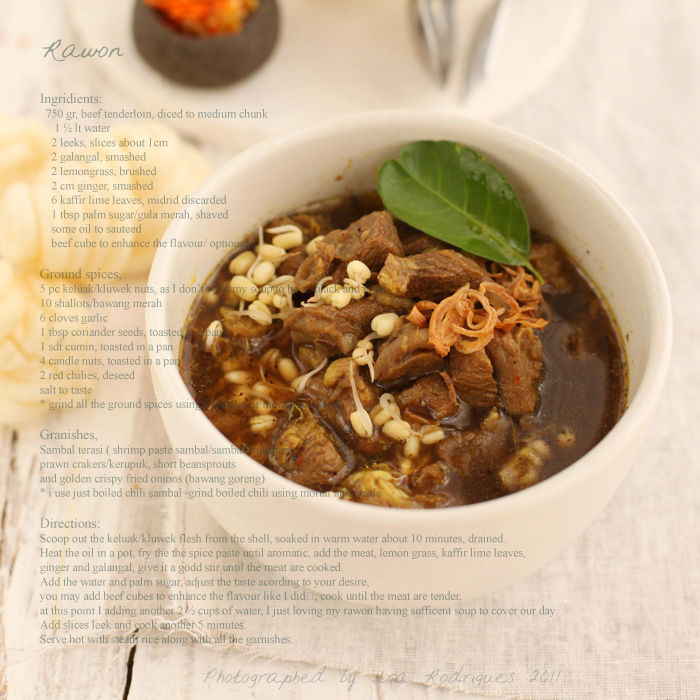 Rawon is sometimes dubbed as Indonesian beef black soup, and it pretty much covers the description. The dark soup is produced by the use of an ingredient called buah kluwek or buah picung or Pangium edule in Latin. 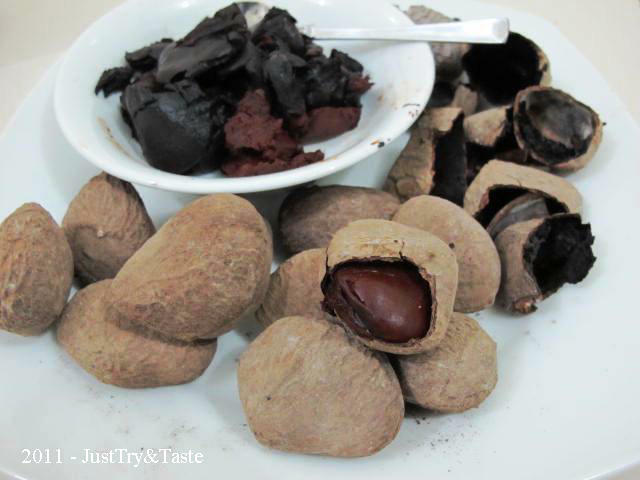 This kind of nuts is believed to be an original Indonesian spice, and it is quite popular in Southeast Asia. Use properly, and the nuts will be the saviour of the dish. Use wrongly, it can ruin your meal. The key is the choosing process, and the best nuts are the old ones, which are light weighted. Apart from the nuts, various other spices such as galangal, turmeric roots, candle nut, bay leaves, lemongrass, ginger, coriander, and cumin, are also used to obtain rich, deep flavour of the broth. A bowl of rawon is usually served with fried shallots, small beansprouts, warm rice, salted egg, crackers, and some fiery sambal (grounded chilli paste/sauce). 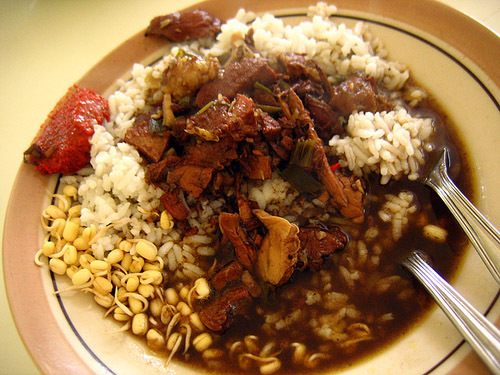 Rawon is a pride dish from Surabaya, the capital city of East Java. There are several similar dishes in the other areas in Indonesia, such as kuah pucung in Jakarta and palu kalua in Makassar. Apparently, rawon was commoners' food in the past, but surprisingly it became popular among the royal members as well, due to the high popularity it had from every walks of life. 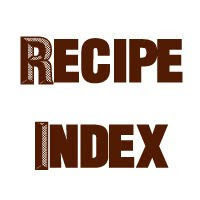 Formerly, the dish only used sliced or cubed beef, but nowadays we can easily find menus like rawon buntut (ox-tail rawon) or rawon lidah (ox-tongue rawon) in restaurant menus. Frankly, I have never tasted a proper bowl of rawon. When I was younger and first heard the term rawon, the first thing came into my mind was a bowl of soup with bees inside (bees are tawon in Indonesian, see the name resemblance?). And so I often shuddered upon imagining the dish, and it was not before I was in my high school that I learn the truth. The aunt often makes it, but it's from the instant packed seasoning. So I know the overall flavour, but I maybe can't give a very exact one. So I use Twitter's power, and here's the summary of the testimonies. Although you may be turned off by the dark appearance at first, it actually promises rich, belly-warming broth, with earthy notes from the use of the nuts. The beef slices/cubes should have an adequate ratio of fat, but not too much to spoil the soup's taste. The beef should not be chewy, and infused perfectly by the soup. Put a portion of warm rice, crackers, halved salted egg, fresh tiny beansprouts, and shrimp paste sambal (sambal terasi) around the bowl, and you are on a magnificent ride. I'm sure there are more. Throw in the your favourites, lovely readers! Here's a good recipe if you are planning to make a bowl of this iconic dish of Indonesia. All credit goes to Cooking Tackle (that blog is absolutely gorgeous, BTW). I would really like to have a bowl of rawon in its hometown, but for now I just have to find Indonesian restaurant in Sydney that has rawon on menu. Definitely open to recommendations. 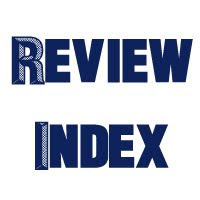 I enjoyed reading your review on Rawon. I had never heard of the dish before. If I'm ever in an Indonesian restaurant, I will see if I can find it. Hi Carlyn, it's my pleasure. Glad you enjoyed the post. anyway pls check out my blog at www.thetwotales.com. i'm newbie!